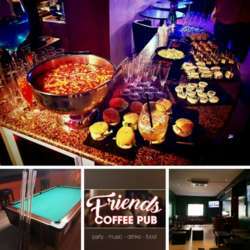 Join us at Friends Coffee Pub, a recently refurbished pub close to Lugano train station. We'll have a separate room reserved only for us with a separate buffet. There's also a separate room with a Pool table if you want to challenge some of your fellow expats, or you could play darts. If you don't want to dance or play, just keep networking around the bar area, whatever you choose the cool gang of InterNations will be there for you catch up or help you make new acquaintances. The nearest parking is at 5 min walk “ex Pestalozzi” (piazzale Besso) and the parking behind the train station. Register by 16:00 of the day of the event. Feel free to bring your friends. If they want the CHF 5.- discount, please ask them to first become InterNations' members, and then to sign-up for this event, in order to be on the guest list. There is no way of being on the guest list without an InterNations membership. The guest list doesn't process "+1", so, when not on the list, the fee shown on "not signed up for event" will apply.